By the 1890s New York's elite were erecting enormous "cottages" like Alva Vanderbilt's Marble House. Even before the outbreak of the Civil War the colonial town of Newport, Rhode Island, had caught the attention of wealthy New Yorkers. As New York City inched northward, swallowing up their summer estates, the wealthy looked for other resorts. Despite the long distance, the charm of Newport coupled with the cooling sea breezes, created a refreshing respite from Manhattan heat and humidity. Newport's charming colonial architecture and atmosphere, along with its cooling seaside breezes, attracted the wealthy in the 1850s. Even in 1856 when the young Belle Brittan summered in Newport, preparations were arduous. The voluminous ante bellum dresses, the many hats, gloves and bags necessitated numerous trunks for a lady's wardrobe. Ms. Brittan wrote to a friend on July 16 about the arrival of one woman’s luggage. Hotels were no longer acceptable for New York's wealthy. Construction turned into a frenzy, with millionaires vying to outdo one another in throwing up larger and more palatial residences. It would climax towards the end of the century with monumental mansions like Marble House and Rosecliff. 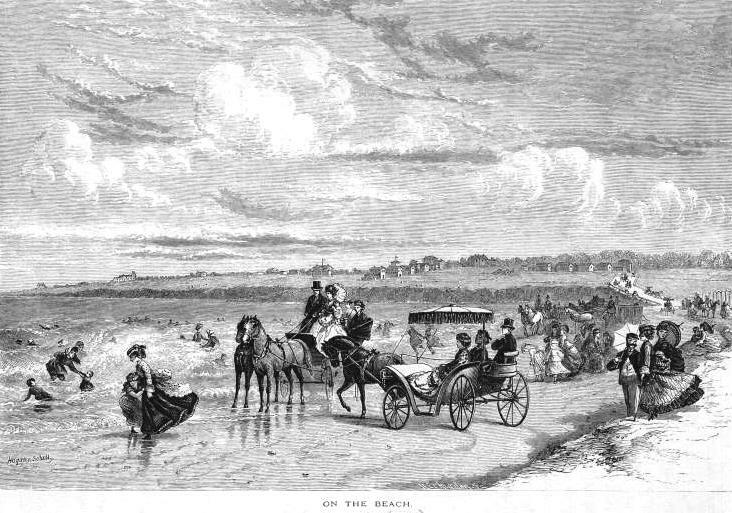 “The season” in Newport was as important as the winter social season in Manhattan. And it took a great deal of money to maintain one’s place in the circle. The season lasted about eight weeks--no more than ten. But the houses and grounds required year-round staffing and maintenance, albeit pared back in the winter. During the summer weeks, the cost of staffing and running a house ran between $2,000 and $4,000 per week (about $50,000 today). A single night’s entertainment could cost $70,000 or more. One socialite’s elaborate ball required a more jaw-dropping display by the next. When Mrs. Hermann Oelrichs entertained one evening at Rosecliff, her opulent mansion modeled after the Grand Trianon at Versailles, she had a fleet of white ships constructed to float offshore in sight of the gardens. The ships complimented the swans she stocked in the fountain and the masses of white roses, lilies, orchids and hydrangeas that decorated the house and lawns. "Tessie" Oelrichs, the sister of Virginia Fair Vanderbilt, was a leading figure in Manhattan-Newport society. 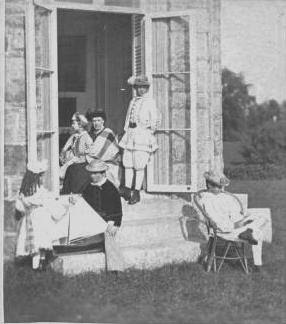 She entertained lavishly from Rosecliff (above). The massive homes required tiers of staff. English butlers, French chefs, European governesses and nurses, several ranks of maids and kitchen help were necessary. One historian noted that “the less a woman appeared to be capable of performing any useful task, the more positively it reflected upon her husband’s social standing.” Crates of silver from Tiffany’s and china from France stocked the pantries. And then there was the matter of the ladies’ wardrobes. Women required no fewer than 280 changes of costume during a typical season. Off-season trips to France were not simply to sample the cuisine and see the sights; they meant hours spent in the salons of Paris designers. The millionaires who made their fortunes in banking and real estate showed off their wealth through horses and exclusive club memberships. Their wives displayed their financial and social status in gowns and jewels. The women changed costumes several times a day. There were reception gowns, dinner dresses, visiting dresses, evening gowns and day dresses. And there was one cardinal rule: never wear the same dress twice. The wealthiest of the New York-Newport socialites patronized the House of Worth in Paris, among them the Astors, Rockefellers, Vanderbilts, Fishes and Carnegies. While some return clients would spent around $10,000 on a season’s wardrobe, others would spend that amount on a single ball gown. Mrs. Stuyvesant Fish is remembered for greeting a group of guests in her opulent Newport mansion one evening saying “Here you are again; older faces and younger clothes.” When the season ended, all the dresses and gowns worn that year were given away, sent off to poorer relatives or given to servants. The next year it would start all over. Social climbers risked their entire fortunes in attempts to be noticed by Newport society. An engraved invitation to dinner or a dance from Mrs. Fish or Mrs. Astor was a coup—it meant acceptance. It also meant the lady of the house was expected to join in a regimented routine. Mornings were spent at Bailey’s Beach—in full dress, of course--a private beach at the end of Cliff Walk. Afternoons were taken up in luncheons, teas, and perhaps other activities like tennis or archery. Evenings included dinners and a party at one cottage or another. Acceptance into Newport society could very well mean the financial failure of the husband not rich enough to keep up. 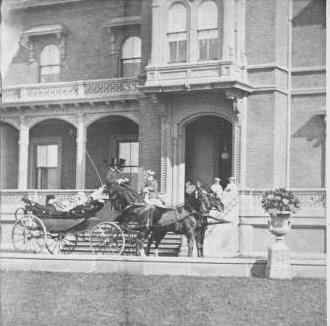 The mistress of a Bellevue Avenue mansion was expected to give no fewer than six dinners for sixty guests and two balls for 600 within the eight to ten-week season. The leading socialites would spent millions of dollars of their husbands' fortunes each summer. The vast mansions of that glittering era remain, perched upon the cliffs over the sea. The breezes still waft over the lawns, but no longer do they cool the parasol-shaded heads of New York’s wealthiest women. In some, troops of tourists in madras shorts and flip flops tromp through the gilt drawing rooms; proof that the Gilded Age has indeed come to a close. Really loved the architecture of the building thank you for sharing your thoughts and time. Especially last picture looks amazing!! !